Fall is just around the corner! Not only does that mean lower temperatures and shorter days, it also means increased rainfall and less water needed from sprinklers and irrigation systems. What exactly does this mean for your lawn and landscape? It means you’ll have many months to worry a little less about watering your lawn and a little more time to enjoy your yard. As the weather cools, your lawn and gardens will require less water. Cooler temperatures means less evaporation, so your soil retains more water. We usually start to see a bit of additional rainfall during the fall months, so make sure the rain sensor in your irrigation system is working properly. If it rains enough to provide 1-inch of water to your landscape, there’s no need to run your system that week. Not sure how much rain you’re getting? Install a rain gauge in your garden. Add a few inches of mulch to your landscape beds and you’ll make better use of the free waterings. As we head into October and November when the night temperatures dip even further, reducing irrigation to once every two weeks is recommended. Once lawns go dormant in winter, watering them once every two to three weeks is adequate. 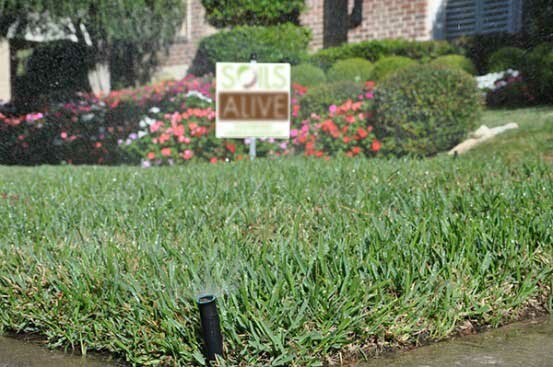 It’s easy to forget to adjust your irrigation system as we head into fall. Without realize it, you may still be watering at summer levels or durations. This could mean you’re over-watering once the temperatures cool. When lawns gets too much water, the possibility of fungal issues such as Take-All Root Rot increase. When lawns are weakened from fungal diseases, they become more susceptible to a host of other problems including insects and even an influx of weeds! If you haven’t already, fall is a great time to have your sprinkler system audited to be sure rain sensors are working and each zone is set to water plants properly. If you need a certified irrigation specialist to come to your property, give us a call for a recommendation.